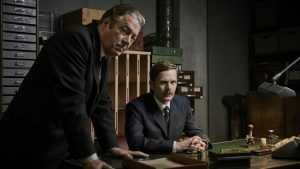 Set in 1969, the new series of ITV’s Inspector Morse prequel sees Shaun Evans return as DS Endeavour Morse and Roger Allam as DI Fred Thursday. Produced by Mammoth Screen in a co-production with Masterpiece, each story in the highly-anticipated sixth series will once again be written by series creator Russell Lewis who has penned each of the 23 screenplays to date. Alongside Shaun Evans and Roger Allam, the new series will see Anton Lesser as CS Reginald Bright, alongside Sean Rigby as DS Jim Strange, James Bradshaw as Dr Max DeBryn, Sara Vickers as Joan Thursday, Abigail Thaw as Dorothea Frazil and Caroline O’Neill as Win Thursday. With the old Cowley team now scattered across Oxfordshire, Endeavour has reluctantly settled into a sedate way of life in an isolated countryside outpost. An uncomfortable Thursday also has a new role at the forbidding Castle Gate station, joining former adversary DCI Ronnie Box and his new sidekick DS Alan Jago. “Things are bad with Fred’s wife Win. She wanted him to retire but he can’t as he’s in financial difficulty after he was done out by his brother. With his son Sam in the Army and Joan not at home, it’s an empty nest. 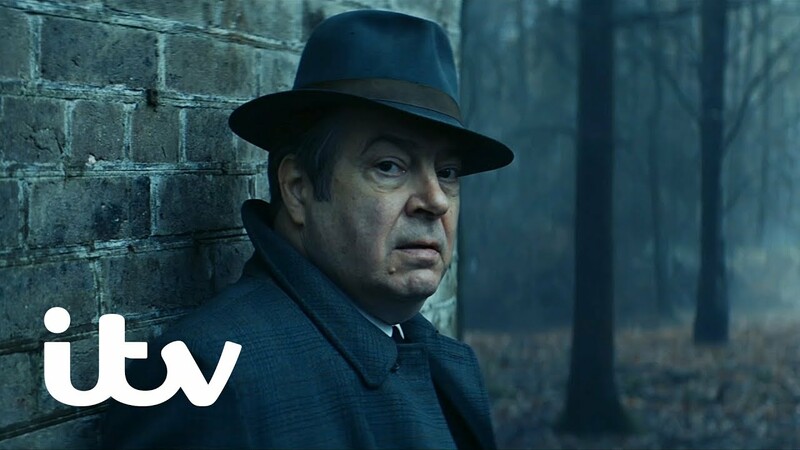 Home’s a chilly place…” explains Roger Allam. Box is keen to get Endeavour out of the picture, but when Endeavour’s own investigations manage to uncover a potential suspect, a homeless drug-fuelled teenager named Stanley, Box dangles the suggestion that the arrest could be Endeavour’s way back into CID. You may have spotted DI Thursday in ITV’s campaign celebrating the powerful characters, stories and creativity. The Patriarch was directed by James Marsh, whose credits include The Theory of Everything and Man on Wire, with Max Richter’s beautiful score On the nature of Daylight. Endeavour returns on Sunday February 10 at 8 pm on ITV. The next episodes are titled Apollo, Confection and Degüello. I stumbled upon Endeavour by accident while looking for episodes of Inspector Morse. The discovery was an unexpected pleasure! I saw all five seasons -er- series and only just now found that Endeavour returns tonight! I’m overjoyed. Of course I really liked Shaun Evans portrayal, but the big surprise for me was Roger Allum. Previously unfamiliar with his performances, he just knocked it out of the park. They make a great team and I love their chemistry. And Fred Thursday know how to wear a fedora and when to take it off. I can’t wait to watch Series VI and hope there’ll be a VII. This is a class series. Fred Thursday reminds me of a few characters from those days. Ex service,respects authority and tradition, a hard man when required, always sticks to the rule book unless it requires a bit of persuasion. Roger and the team do a terrific job in making this so real. Well done . The Morse-movies have an extremly high standard both in regard of the actors and the direction. My wife and I stumbled onto Endeavour thanks to a recommendation from Amazon Prime. Although we live in the States, we prefer British television. 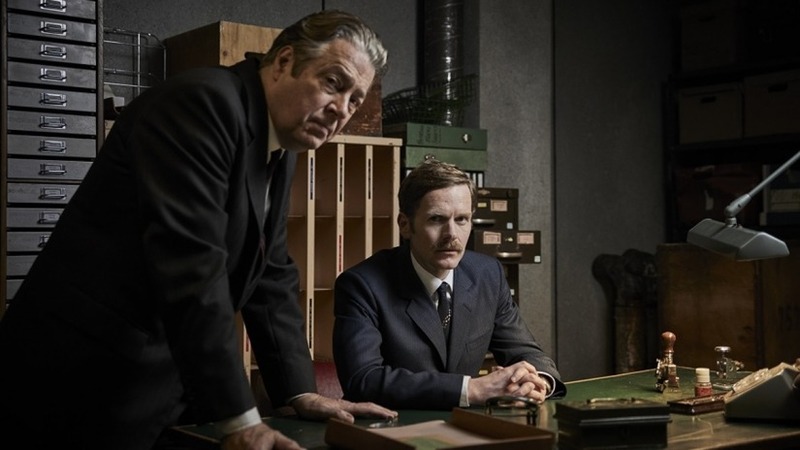 We’ve become fans of this program—the writing and production values are excellent, but we especially appreciate the fine performances of Shaun Evans and Roger Allam. We’ve seen Roger in plenty of productions over the years (especially enjoyed that episode of ‘Midsomer Murders’), but his work as Fred Thursday is wonderful. We look forward to getting series 6 over here, but I expect I’ll watch them all again. The mysteries are interesting, but they’re just the glue that holds together the scenes between Morse and Thursday. That’s the reason we watch. I have been a fan of Morse ever since the original series began, and to be quite frank, was dubious as to whether they could do it justice when Endeavour was brought out.I could not have been more wrong! The acting, writing, filming, period feel and integrity of the series is wonderful, and Shaun Evans does the character proud. All the cast are brilliant, and the subtlety of the performances has got better with each series. Probably, for me, the most touching scene was in the first episode, when Abigail Thaw met the young Morse for the first time in her office at The Oxford Mail.The two actors must have loved filming it, and I’m sure Abigail Thaw must have been thinking of her father at the time.There were a couple of great little Easter Eggs in the last episode of the current series which are worth looking out for in the repeats.the first was Roger Allam referring to Holly Martins as his favourite author in a conversation with an Oxford academic they were questioning. Holly Martins was Joseph Cotten’s character in ‘The Third Man’ and wrote Western novels much loved by Bernard Lee’s Sergeant character. The second was the mention of Tackleberry by one of Morse’s colleagues -of course this was the comic, gun toting cop in the Police Academy movies.How they kept a straight face I’ll never know. Congratulations to everyone involved with the series-this is quality British TV at it’s very best and deserves to be recognised as such. Shaun Evans may not have seen the original Morse and apparently doesn’t like comparisons between his work and that of John Thaw, but I think he should feel proud to be continuing Thaw’s legacy. Morse is more than just a fictional detective series, it is something one lives rather than watches.